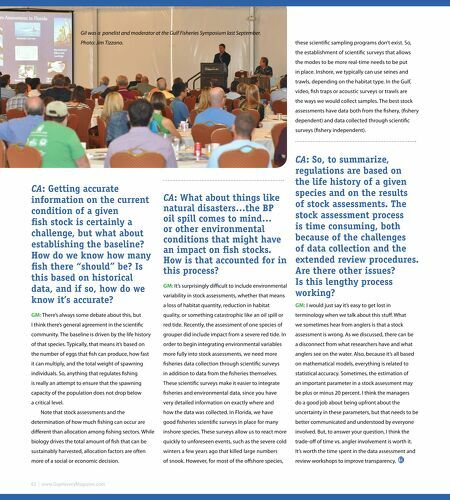 Gil was a panelist and moderator at the Gulf Fisheries Symposium last September. these scientifc sampling programs don't exist. So, Photo: Jim Tizzano. the establishment of scientifc surveys that allows the modes to be more real-time needs to be put in place. Inshore, we typically can use seines and trawls, depending on the habitat type. In the Gulf, video, fsh traps or acoustic surveys or trawls are the ways we would collect samples. The best stock assessments have data both from the fshery, (fshery dependent) and data collected through scientifc surveys (fshery independent). CA: Getting accurate information on the current condition of a given fsh stock is certainly a challenge, but what about establishing the baseline? 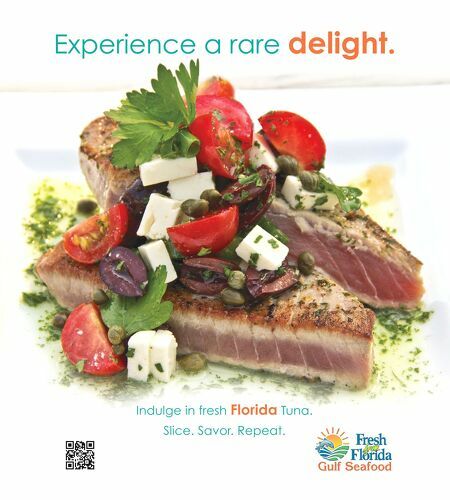 How do we know how many fsh there "should" be? Is this based on historical data, and if so, how do we know it's accurate? CA: So, to summarize, regulations are based on the life history of a given species and on the results CA: What about things like of stock assessments. The natural disasters…the BP stock assessment process oil spill comes to mind… is time consuming, both or other environmental conditions that might have because of the challenges of data collection and the an impact on fsh stocks. How is that accounted for in extended review procedures. this process? Are there other issues? Is this lengthy process GM: It's surprisingly difcult to include environmental working? variability in stock assessments, whether that means a loss of habitat quantity, reduction in habitat GM: I would just say it's easy to get lost in GM: There's always some debate about this, but quality, or something catastrophic like an oil spill or terminology when we talk about this stuf. What I think there's general agreement in the scientifc red tide. Recently, the assessment of one species of we sometimes hear from anglers is that a stock community. The baseline is driven by the life history grouper did include impact from a severe red tide. In assessment is wrong. As we discussed, there can be of that species. Typically, that means it's based on order to begin integrating environmental variables a disconnect from what researchers have and what the number of eggs that fsh can produce, how fast more fully into stock assessments, we need more anglers see on the water. Also, because it's all based it can multiply, and the total weight of spawning fsheries data collection through scientifc surveys on mathematical models, everything is related to individuals. So, anything that regulates fshing in addition to data from the fsheries themselves. statistical accuracy. Sometimes, the estimation of is really an attempt to ensure that the spawning These scientifc surveys make it easier to integrate an important parameter in a stock assessment may capacity of the population does not drop below fsheries and environmental data, since you have be plus or minus 20 percent. I think the managers a critical level. very detailed information on exactly where and do a good job about being upfront about the how the data was collected. In Florida, we have uncertainty in these parameters, but that needs to be determination of how much fshing can occur are Note that stock assessments and the good fsheries scientifc surveys in place for many better communicated and understood by everyone diferent than allocation among fshing sectors. While inshore species. These surveys allow us to react more involved. But, to answer your question, I think the biology drives the total amount of fsh that can be quickly to unforeseen events, such as the severe cold trade-of of time vs. angler involvement is worth it. sustainably harvested, allocation factors are often winters a few years ago that killed large numbers It's worth the time spent in the data assessment and more of a social or economic decision. of snook. However, for most of the ofshore species, review workshops to improve transparency.